Several of you have you have emailed me asking whether it's possible to install a keylogger on a victim's computer using Metasploit. The answer is a resounding "YES"! So, by popular request, in this guide I'll show you how to install a keylogger on your girlfriend's, boyfriend's, wife's, or husband's computer. For those of you wondering what a keylogger is, the simple answer is that it's a piece of software or hardware that captures every keystroke and saves them for retrieval by you, the attacker. These types of devices have long been used by hackers to capture logins, passwords, social security numbers, etc. Here we will use it to capture the keystrokes of a cheating girlfriend. Fire up Metasploit and let's get started. Like in my last article on disabling antivirus software, I'm assuming that you've successfully installed Metasploit's powerful listener/rootkit on the target system. You can also check my earlier Hack Like a Pro articles for a variety of ways to get it installed. Notice in the screenshot above that we have a listing of every process running on the victim system. We can see about 1/3 of the way down the process listing with a Process ID (PID) of 912, the Notepad application is open and running. Now that we have migrated the Meterpreter to the Notepad, we can embed the keylogger. With this command, Meterpreter will now start logging every keystroke entered into the Notepad application. Let's now move to our victim system and write a short note to make sure it works. 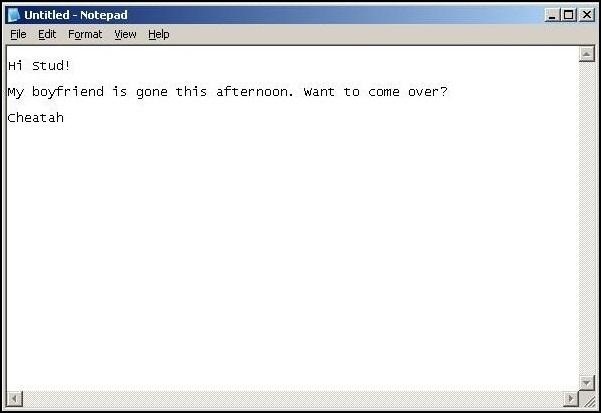 As you can see in screenshot above, Cheatah has written a short note to Stud, asking him to come visit while her boyfriend is gone. All of these keystrokes are being captured by our keylogger providing us with evidence of her cheating heart (or some other organ). As you can see, every keystroke has been captured including the tabs and end of line characters. Now you have the evidence on Cheatah! In my next articles, we'll continue to look at other powerful features of Metasploit's Meterpreter. hello after firing up metasploit, how do i get into the meterpreter prompt ? how to get in meterpreter?? Will this allow the ability to capture a Windows domain password if the computer is locked or sitting at the Control-Alt-Delete screen? I have written several other tutorials on using Metasploit's meterpreter, so please check those out. The answer to your question, though, is yes. The merterpreter is a payload in Metasploit. After choosing an exploit, then choose a payload that has the meterpreter. if so then where can i find "listener" from. If i've gained access with i e unsafe scripting how do i get to meterpreter? Does ps automatically bring me to meterpreter? This without a doubt should be illegal. People should leave a relationship if they have someone monitoring everymove. Having been insecure in relationships in the past, paranoia shouldnt lead you to violate someones privacy, its beyond controlling and potentially dangerous. Im all for the freedom of information on the internet, its incredibly helpful at times, but having seen the nature of ill will human beings, i fear that people will only abuse the knowledge and skills they obtain from something like this. Sigh. I'm gonna quote something I saw once. "If you have to hide, lie, and cheat about something you're doing, then you probably shouldn't be doing it." Thanks for your insights. This is meant as a playful, fictionalized situation. Thanks for making the consequences of the real thing to our attention. If you are new to hacking, start with my tutorial "Hacking for Newbies". 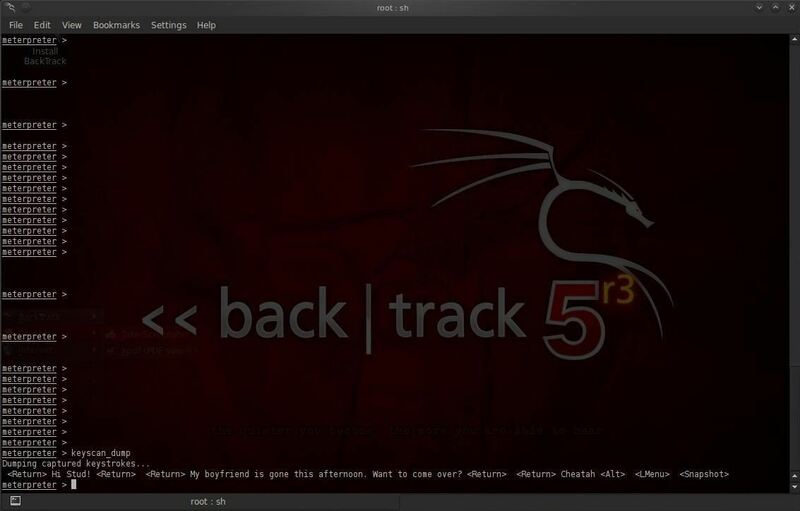 It will walk you through the basic steps to provide you the fundamentals to become hacker. Once you get the meterpreter on the victim's system, it is virtually undetectable. No, it is only necessary that your computer has metasploit. By the way, Welcome to Null Byte, Abhriram! Since you are new here, I suggest you start with my "Hacking for Newbies". It lays out a program to get started in hacking. Great article, but what if i want to see what password the victim is typing for example on facebook log in page in chrome? where should i "migrate"? Migrate to the browser that she is using. Can I put the listener to a windows 7 OS computer and I'm using the Linux? I have few Windows 7 hacks on Null Byte. Check them out. Once you have the Meterpreter on the victim system, you can do just about anything, including putting a keylogger on it. P.S. Welcome to Null Byte! If anyone knows someone that could hack my girlfriends pc so I can have access to anything on her computer. I will pay. Sir OTW, In case I am the victim of this kind of attack,if i will reformat or re-install new windows, is that mean that the keylogger will be gone in my system? This technique doesn't require you have physical access to her computer. If I understand it right, I don't need to have any physical access to the victim's computer, right? And what if I don't even know the mail, phone number or ID (basically I don't know anything). Does this guide work in that case? You need an IP address and the operating system. Of the victim? I just know the OS. So I can't use this method? You need to know your IP and the victim's IP. In addition, you may need to know more about the victim depending upon the exploit you use. I suggest you start by reading my "Hacking for Newbies". Check out my tutorials on recon here. which recon tutorial is about doing a recon on a victim who is not with the same network as yours? Could I use it on a school computer without getting caught or get backtraced? You can use it on a school computer, but you will likely get caught if you don't use adequate measures to make you actions anonymous. How do I make them anonymous? You are new here, Benjamin. I recommend you study further before you attempt these hacks and land in prison. Start with this plan of study, I put together. Hi, I tried to install the Metasploit but I guess my anti-virus won't let me proceed. I also tried to disable the anti-virus but it doesn't work neither. Can you PLEASE explain in details on how to hack my computer please? I am going through a very rough situation and I believe this could give me a solution. I hope to hear from you soon! Are you installing it on Windows or Linux? Is there a way to get metasploit onto his computer if its locked? Because all the videos I've found on recovering the windows logon password don't actually recover it, they delete it or reset to a new password and I don't want to do that. This attack does not depend upon the password. It exploits a flaw in the operating system. Even if the system is locked (but on), it will work. I'm sorry. I'm new to this. I found some messages of my spouse and the ex and now I'm locked out of the comp. I have no idea what I'm doing. I just want to get the windows logon password. From what I understand from reading the comments is that I just need his IP address and OS. How do I obtain his IP address if the computer is locked? His OS is windows 7. This attack will not work on Windows 7. Take a look at my Windows 7 hacks. i know why, im targeting windows 7 pc and you said in the comment above it doesnt work then. i tried searching for it but no resaults? The process is exactly the same. Get a meterpreter shell on the Windows 7 system and run the keylogger script exactly the same as in this article. Try again. Things don't always go smoothly with hacking. Isnt it possible to set the keylogger to "log" everything the victim is typing. Instead of just the notepad. I tried to migrate the keylogger onto chrome, but with no results? So basically I'm trying to ask about, what i can migrate the keylogger on? Maybe i choosed the wrong chrome.exe to migrate. I counted to 5 chrome.exe (In the ps list) How do i know i choosed the right chrome to migrate? Migrate to the chrome process and then any keystrokes on chrome will be recorded. Do I need Kali or similar? but running metaspoilt on ubuntu 15. works too right? an finally is there an instructive form the begening? Hey Great Posting ! , Can you help me how to install an keylogger at an Mac OS X i can't find this anywhere .. is it not possible to this ? And what if you have acces from the Mac Os X computer. Hope to hear you soon ! is there a way to save the keystrokes into a file on the victim's computer? This actually saves the keystrokes on the victim's computer until we retrieve them. This method worked for me with notepad but I was trying to make it work with Google Chrome but I can't seem to migrate that process("Error running command migrate: Rex::RuntimeError"). And after that Meterpreter seems lost after that because I can't run any other command anymore. I tried migrating explorer.exe and this logged EVERY key also from Google Chrome so that seems to be a one of the solutions. Can you please tell me where should i start ? means how to send keylogger to victims computer ? hello please can i install it Window 7. Yes, but you will need a Windows 7 exploit. i succesfully got the meterpreter, checked the privileges (admin). My attacking machine is a VM with kali 2.0 while the target machine is the host with WIN 7 professional X64. Did you migrate to the proper process? To make sure, when listing the processes with PS we get a PID and PPID the PID is the Process ID right?? If that is the case i migrated to the correct process. Should work then. Did you first run keyscan_start? First, I see that you migrated to explorer.exe. That is NOT the Internet Explorer. Try migrating to notepad or winword. When i said explorer i meant the windows process not the browser (who uses IE :p ) From the readings i have done, using the keyscan or keyrecorder on explorer.exe allows us to record all the keystrokes, isn't it right??? sir, what if we want to install permanent keylogger to the victim system like REFOG Free Keylogger or any other exe file or rar file. Is it possible? Yes you can, this tutorial can help you de so. Yaa but can you please explain me that how can I send a file and execute it? You need to first find a vulnerability in the target, then use the proper exploit from Metasploit and use the meterpreter payload. From there, you simply need to run the keyscan keylogger. And i want to wake up a billionaire with infinite powers, meanwhile either as OTW said you scan for a vulnerability that you would exploit and that would allow you to send a keylogger. OTW has some amazing how-to about this / click here. Otherwise you get physical access to the machine and install your payload. How to install a keylogger on android using metasploit. Please give a tutorial on that too. 2) is it possible to create an exploit in msfconsole that will deliver reports in gmail instead of sitting behind terminal monitoring the target? Thank you great minds. I will really appreciate your answers. Will this Kali Linux keylogger program work on a MacBook Pro? How do you remove it from the test subjects pc once installed?